Grey Wagtails have a generally easterly distribution in the county, with a preference for higher altitudes. As in the First Atlas, the lines of some of our rivers and canals show up on the atlas map, notably the Bollin, Dean, Dane and the Mersey/ Manchester Ship Canal. But Grey Wagtails have considerably expanded their distribution and have noticeably spread into some urban areas, including Wallasey/ Birkenhead, and Widnes/ Runcorn. Although the general picture is of strong increase in the last twenty years, with 149 tetrads gaining breeding presence and 80 losses, the decline in much of western Cheshire is puzzling. They used to be confined to sites alongside water, usually fast-flowing, and especially when bordered by native broadleaved trees, but are now more widespread as a breeder. However, almost three-quarters of the submitted habitat codes are G – freshwater, with the overwhelming majority running water (G6 – G10), mostly streams and rivers; the rest are mainly human sites and farmland. 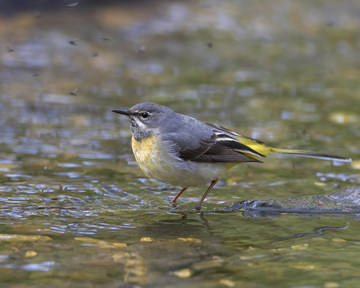 Although they are primarily associated with water, their food is mostly flies, caterpillars and spiders of terrestrial origin, so the Grey Wagtail is less susceptible to the effects of stream acidification than species such as the Dipper which share its riparian habitats. Grey Wagtails make an early start to the breeding season, nesting on a ledge, amongst tree roots or beneath man-made structures such as bridges or culverts from late March and April. Young from second, third or replacement broods may still be in the nest in August. This lengthy season gives observers plenty of opportunity to record high-level breeding status codes, so it is a little surprising that they were proven to breed in only 45% of the tetrads in which the species was found, mainly from records of adults carrying food (37) or observations of recently-fledged young (49). Their incessant calls, similar to those of the Pied Wagtail but rather more clipped, readily draw attention to birds with chicks in the nest or nearby. There were too few registrations of Grey Wagtails on the BBS transects in 2004 and 2005 to produce a robust population estimate for the county, but modelling using a detection probability derived from the national dataset suggests a Cheshire and Wirral total of 870 birds (confidence range of 10 to 1,740), considerably higher than the estimate in our First Atlas of 120-150 pairs. As largely insectivorous residents, their population can be adversely affected by severe winter weather and numbers may vary considerably between years, but the national Waterway Birds Survey index has increased by more than 40% since 1984, and the species has clearly spread into new areas in the last twenty years, so this figure seems not unreasonable. Assuming this to be 435 pairs it corresponds to a density of ~2.5 pairs per tetrad in which breeding was confirmed or probable. Workers studying the species usually quote a linear density, which can vary widely, but averages ~0.5-1 pair/ km on a variety of rivers (Simms 1992); the Cheshire and Wirral figure probably lies within this range.